The hardship faced by rail passengers in the last four years over delayed operation of Kanniyakumari Express is to end soon. CHENNAI: The hardship faced by rail passengers in the last four years over delayed operation of Kanniyakumari Express is to end soon. Southern Railway has decided to delink rake sharing arrangement of Kanniyakumari Express with Island Express operated between Bengaluru and Kanniyakumari. The late arrival of the latter delays the former at Kanniyakumari, it is pointed out. “We have proposed to add two more rakes for Pearl City Express, operated between Chennai and Thoothukudi. This means, two rakes of Kanniyakumari Express will have rake link with Pearl city with the primary maintenance at Thoothukudi. On arrival of new coaches, the new rake link will be implemented,” a senior railway official said. The first rake link for Kanniyakumari Express was introduced with Pearl City Express on April 6th 2013. However, aiming at optimum utilisation of rakes, on July 1, 2014, Southern Railway introduced rake link between Island Express and Kanniyakumari Express, with primary maintenance at Bengaluru. The move has helped railways to reduce use of two rakes. The Island Express from Bengaluru is scheduled to reach Kanniyakumari at 3.20 pm, while the same rake will depart as Kanniyakumari Express at 5.20 pm. In the short span of time, the coaches are being cleaned at the yard and taken back to platform, besides filling water. Since introduction of this rake link, Kanniyakumari Express is often delayed by 30 minutes to five hours for nearly four years. This puts the passengers to great hardship. Official sources said the Island Express had to cover the 944 kms in highly congested routes with the stoppages at 38 locations enroute.”Railways could neither increase the speed of train, nor reduce its stops. In addition, thick fog between November and February in several sections also delays the train,”said official sources. Currently, with four rakes Pandiyan Express (Chennai - Madurai) has rake link with Rockfort Express (Chennai - Tiruchy) with the primary maintenance at Gopalswamy Nagar yard, Egmore. A similar pattern is to be followed for Kanniyakumari and Pearl City Expresses, explained the official. 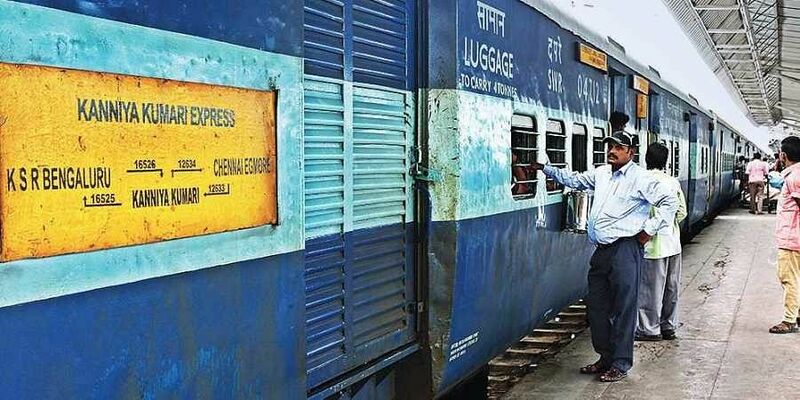 Poor punctuality of Kanniyakumari Express has forced railway officials to introduce dedicated rake for Kanniyakumari Express that connects Sate’s border district with Chennai, added officials sources.